Darlene Love, Elvis Costello and Dion were among the stellar performers Tuesday night at a rollicking benefit for Little Kids Rock. 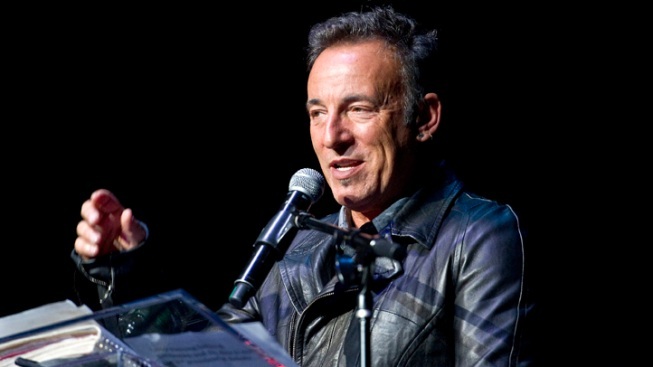 Bruce Springsteen presented the Big Man of the Year award to Steven Van Zandt at the Manhattan Center Grand Ballroom. The night busted open in New York City as Bruce Springsteen and other Rock and Roll Hall of Famers helped Steven Van Zandt celebrate his Big Man of the Year award. Darlene Love, Elvis Costello and Dion were among the stellar performers Tuesday night at a rollicking benefit for Little Kids Rock, an initiative that rescues music education amid public school budget cuts. Springsteen had some fun while presenting the award — gleefully detailing their roommate days and Van Zandt's lack of housekeeping skills. "What a liar," Van Zandt retorted with a grin. Amid the musical blowout, Van Zandt and the other stars discussed the arts' role in fueling young minds and shaping character — tasks accomplished through the thousands of musical instruments and the lessons made possible by Little Kids Rock. Costello, before going onstage, waxed eloquently on the "mundane and magical" aspects of music, and its transformative effects. Van Zandt said in an AP interview before the show that children might see a musical career as glamorous and fun — "and it is." But it also "requires a lot of work, just like any other craft. ... You need discipline and you need willpower and focus. And ...a lot of hours put into it," he said. So people might be surprised to know that Van Zandt, while concentrating on a multitude of parallel careers, can go three years without playing a guitar, and then pick it up again in a week or two. "When you've been playing so long, you don't really forget how to play," he said. "Well, that's not a good example for the kids, though," he conceded, laughing. "That's just me. ... 'You kids: Don't do what I do — do what I say.'" The charity named the award for E Street Band saxophonist Clarence Clemons in 2009, two years before he died. Clemons' nephew, Jake, who now tours with the E Street Band playing saxophone, lent heartfelt accompaniment to Little Kids Rock musicians from Franklin L. Williams Middle School in Jersey City, N.J.
Singer-guitarist Tom Morello, serving a blistering homage to Van Zandt's old anti-apartheid song, "Sun City," told the crowd how it helped stoke his own activism as a student at Harvard University. Some bad-boy appeal came when rocker Jesse Malin climbed onto a table of people dining near the stage, singing as he traipsed in sneakers amid stemware on the tablecloth. Besides working with Bruce Springsteen and E Street, and camping it up in mobster roles — his most recent on the Netflix show "Lilyhammer" — Van Zandt works as a record and television producer, radio host, songwriter and arranger, and oversees two satellite channels. The self-educated music historian is also chairman of the Rock and Roll Forever Foundation, which is developing curriculum for schools. Not bad for a guy who endured his own school days as a self-described "freak," ''misfit" and "outcast." "That was particular to my generation," he said. Now, being a musician is "acceptable. ... But it wasn't so respectable in the 60s." In the long run, though, Van Zandt said music saved his life — and he wants to return the favor. "It's why I support Little Kids Rock."